Wood Land School is an ongoing project with no fixed location and a shifting form. It seeks critical engagement within the realms of representation, film, contemporary art, land, and politics on Turtle Island and beyond. Each iteration of Wood Land School carries forth with it a commitment to address the lack of structural inclusion, both historically and in the now, in a multiplicity of institutional spaces. It is a conceptual and physical space for Indigenous people, with Indigenous people deciding its directions, structures and functions. An important aspect of Wood Land School is the inclusion of non-Indigenous people, so as not to exclude anyone interested in engaging with the complexities of the aforementioned issues. 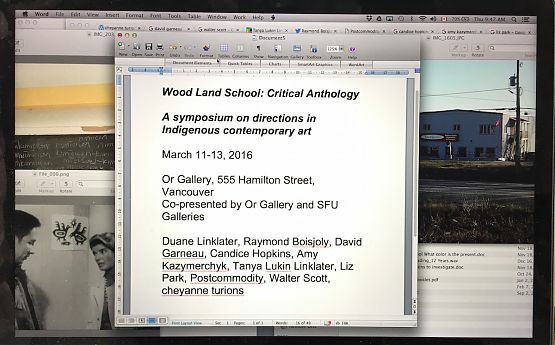 Wood Land School started in 2011 with a small exhibition of works, selected by Duane Linklater, in a studio space located above a store on the Nipissing First Nations in Ontario. Since then it has taken many forms such as residencies, seminars, film screenings and discursive happenings, in places such as The Banff Center for the Arts, Art Metropole, and Simon Fraser University. Duane Linklater is Omaskêko Cree, from Moose Cree First Nation in Northern Ontario, and is currently based in North Bay, Ontario. He was educated at the University of Alberta, receiving a Bachelor of Native Studies and a Bachelor of Fine Arts. Duane attended the Milton Avery Graduate School of Arts at Bard College in upstate New York, completing his Master of Fine Arts in Film and Video. Duane produces a range of work including video and film installations, photography, sculptural objects, and often works within the contexts of cooperative and collaborative gestures. He has exhibited and screened his work nationally and internationally at the Vancouver Art Gallery; Family Business Gallery in New York City; Te Tuhi Centre for Arts, Auckland, New Zealand; City Arts Centre in Edinburgh Scotland; and at the Institute of Contemporary Arts, Philadelphia. His collaborative film project with Brian Jungen, Modest Livelihood, was originally presented at the Walter Phillips Gallery at The Banff Centre as a part of dOCUMENTA (13) with subsequent exhibitions of this work at the Logan Centre Gallery at the University of Chicago, Catriona Jeffries Gallery in Vancouver and the Art Gallery of Ontario. Duane was also the recipient of the 2013 Sobey Art Award, an annual prize given to an artist under 40. Duane is currently represented by Catriona Jeffries Gallery, Vancouver. Raymond Boisjoly is an artist of Haida and Québécois descent, living and working in Vancouver. Boisjoly’s practice operates as active speculation, engaging issues of aboriginality, language as cultural practice and the experiential aspects of materiality. His process is situated in proximity to photography, and concerns the nature of technology and its transmission as a means to index and understand cultural transformation. Boisjoly has presented work in solo and group exhibitions at institutions including the Senter for Nordlige Folk, Manndalen; Simon Fraser University Gallery, Vancouver; Esker Foundation, Calgary; Catriona Jeffries Gallery, Vancouver; the Contemporary Art Gallery, Vancouver; the Power Plant Contemporary Art Gallery, Toronto; and Western Bridge, Seattle. Candice Hopkins is a Curatorial Advisor for dOCUMENTA 14. She has held curatorial positions at the Museum of Contemporary Native Arts, National Gallery of Canada, the Western Front and the Walter Phillips Gallery. Hopkins’ writings on history, art, and vernacular architecture are published by MIT Press, BlackDog Publishing, Revolver, New York University, Fillip, and the National Museum of the American Indian, among others. She has lectured widely including a keynote presentation with Hetti Perkins on the “sovereign imagination” for dOCUMENTA (13). She is co-curator of the exhibitions Close Encounters: The Next 500 Years; Sakahàn: International Indigenous Art; and the 2014 SITE Santa Fe Biennial exhibition Unsettled Landscapes. Hopkins has co-edited the books Recipes for an Encounter (Western Front) and Jimmie Durham: The Second Particle Wave Theory (Walter Phillips Gallery Editions and Art Editions North). Amy Kazymerchyk is the curator of SFU Galleries’ Audain Gallery. She has programmed for VIVOMedia Arts Centre, the Signal + Noise Media Arts Festival, Vancouver Queer Film Festival and DIMCinema at The Cinematheque. Amy has contributed to Artist-Run Culture in Vancouver in numerous capacities and continues to support both institutional and non-institutional artist run initiatives and projects. Liz Park is a curator and writer currently based in Pittsburgh as Associate Curator of Carnegie International 2018. She has curated exhibitions at the Glenbow Museum in Calgary, the Kitchen in New York, the Institute of Contemporary Art in Philadelphia, and Seoul Art Space_Geumcheon in Seoul. Her writing has been published by Afterimage, Afterall Online, ArtAsiaPacific, Performa Magazine, Fillip, MOMUS, Pluto Press, and Ryerson University Press among others. In 2011–2012 Park was Helena Rubinstein Fellow in the Curatorial Program at the Whitney Museum’s Independent Study Program, and in 2013-2015 she was Whitney-Lauder Curatorial Fellow at the Institute of Contemporary Art in Philadelphia. The topics of her curatorial research and writing include the politics of visibility, representation of violence, ghosts, and non-western art in the global context of contemporary art. Tanya Lukin Linklater’s performance collaborations, videos, photographs and installations have been exhibited at EFA Project Space, NYC; Museum of Contemporary Art Santiago, Chilé; SBC Gallery, Montreal; Western Front, Vancouver; Urban Shaman, Winnipeg; Images Festival + Museum of Contemporary Canadian Art, Toronto; grunt gallery, Vancouver; Nuit Blanche, Winnipeg; Museum of Contemporary Native Art, Santa Fe; Culver Center for the Arts, California; People of Good Will Project, Guelph; and elsewhere. She is compelled by the interstices of visual art and poetry, pedagogy, indigenous languages, portrayals of women and children in film, and the body. In 2016, she will present performances at Remai Modern, Saskatoon; Centre Phi + DHC / Art, Montreal; and the Belkin Gallery/UBC, Vancouver; and install new work at Art Gallery of Alberta in a two-person exhibition with Duane Linklater. Her poetry and essays have been published by C Magazine, Access Gallery, BlackFlash Magazine, Yellow Medicine Review, Taos International Journal of Poetry and Art, Drunken Boat, Ice Floe, Western Front Gallery, and McLaren Art Centre. Tanya studied at University of Alberta (M.Ed.) and Stanford University (A.B. Honours) where she received the Mellon Mays Undergraduate Fellowship and the Louis Sudler Prize for Creative and Performing Arts. She is currently a graduate student in Cultural Studies at Queen’s University. She was awarded the Chalmers Professional Development Grant in 2010 and the K.M. Hunter Artist Award in Literature in 2013. She originates from southern Alaska and is based in northern Ontario, Canada. Postcommodity is an interdisciplinary arts collective comprised of Raven Chacon, Cristóbal Martínez, Kade L. Twist and Nathan Young. Postcommodity’s art functions as a shared Indigenous lens and voice to engage the assaultive manifestations of the global market and its supporting institutions, public perceptions, beliefs, and individual actions that comprise the ever-expanding, multinational, multiracial and multiethnic colonizing force that is defining the 21st Century through ever increasing velocities and complex forms of violence. Postcommodity works to forge new metaphors capable of rationalizing our shared experiences within this increasingly challenging contemporary environment; promote a constructive discourse that challenges the social, political and economic processes that are destabilizing communities and geographies; and connect Indigenous narratives of cultural self-determination with the broader public sphere. Postcommodity are the recipients of grants from the Telluride Institute (2007), American Composers Forum (2008), Arizona Commission on the Arts (2009), Elly Kay Fund (2010), Joan Mitchell Foundation (2010), Creative Capital (2012), Art Matters (2013), and the Native Arts and Cultures Foundation (2014). In 2011 the collective’s work was featured in Close Encounters, an international Indigenous exhibition exhibited in multiple venues throughout the city of Winnipeg; Contour, the 5th Biennial of the Moving Image in Mechelen, Belgium; Nuit Blanche, Toronto; Half Life: Patterns of Change, Santa Fe Art Institute, Santa Fe, New Mexico; The Night is Filled With the Harmonics of Suburban Dreams, Lawrence Art Center, Lawrence, Kansas; Here, Pennsylvania Academy of Fine Arts Museum; 18th Biennale of Sydney in Sydney, Australia; Adelaide International in Adelaide, Australia; and Time Lapse, Site Santa Fe, in Santa Fe, New Mexico. In 2013, Postcommodity exhibited their work at the Headlands Center for the Arts, and also opened their art space, Spirit Abuse, in Albuquerque, New Mexico. In 2015, Postcommodity exhibited at the Scottsdale Museum of Contemporary Art and staged a site-specific 2-mile long land installation at the US/Mexican border near Douglas, Arizona. Walter Scott is a Kahnawake-born, Montreal/Toronto based artist working in writing, illustration, performance and sculpture. His ongoing comic book series, Wendy, follows a young woman living in an urban centre whose dreams of contemporary art stardom are perpetually derailed. Recent exhibitions include Habitual Present, 8-11, Toronto; Pre-Existing Work, Macaulay and Co. Fine Art, Vancouver; and Stopping the Sun In Its Course at Francois Ghebaly, Los Angeles. In 2014 he was Artist-in-Residence at the Koganecho Bazaar in Yokohama. cheyanne turions is an independent curator and writer who holds a bachelor’s degree in Philosophy from the University of British Columbia, and is currently pursuing a master’s degree in Visual Studies from the John H. Daniels Faculty of Architecture, Landscape and Design at the University of Toronto. From the farmlands of Treaty 8, she is of settler and Indigenous ancestry. Her work approaches the space of exhibition as alive: the gallery is a space of dialogue where artists, curators and publics can reflect on and experiment with ways of seeing and being in relation. Recently she curated Talking Back, Otherwise, a year-long exhibition at the Jackman Humanities Institute. Forthcoming writing projects include contributions to MAWA’s Desire/Change: Contemporary Canadian Feminist Art; Johanna Householder and Tanya Mars’s More Caught in the Act: An Anthology of Performance Art by Canadian Women; and Meryl McMaster’s Confluence. Her exhibition Other Electricities was presented the award for Innovation in a Collections-based Exhibition by the Ontario Association of Art Galleries in 2014. In 2015 she received the inaugural Reesa Greenberg Curatorial Studies Award and the Hnatyshyn Foundation’s Emerging Curator of Contemporary Canadian Art Award. She sits on the Board of Directors for Kunstverein Toronto, the Editorial Advisory Committee for C Magazine and the Advisory Board for the Art Museum at the University of Toronto. She is the director of No Reading After the Internet (Toronto).